A short drive from the “green rush” of Denver’s legal marijuana boom, national forest police have been staking out a suspected cannabis plantation hidden deep in the woods that is anything but legitimate. 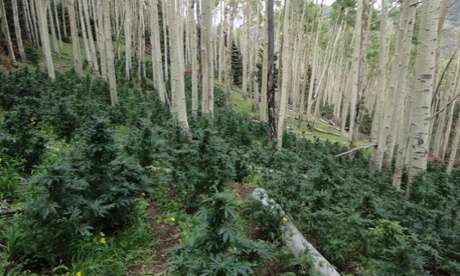 Using aerial reconnaissance and tracking devices attached to resupply trucks, federal special agents were trying to locate the latest gang of armed drug traffickers responsible for more than 100,000 plants discovered growing in national forests since Colorado first began its limited commercial decriminalisation experiment five years ago. The full legalisation of retail marijuana suppliers and growers, which came into effect in January, might have been expected to mark the end of the matter as far as Colorado’s law enforcement authorities were concerned. But the persistence of unregulated grow sites on federal land is just one of many legal tensions exacerbated by the decision of states like Colorado and Washington to jump so far ahead of US national drug policy. In another example, Colorado legislators this month had to pass a new state law to allow for a cannabis co-operative credit union that would let marijuana businesses open bank accounts and escape the murky world of cash-only transactions. Yet most national banks and credit card companies remain barred from dealing with the industry and only last month the federal Drug Enforcement Agency raided four marijuana stores in Denver, smashing doors and forcing open safes in the latest crackdown on businesses suspected of money laundering. The state’s next legal amendment is likely to establish Opec-style production caps to deter its legitimate growers from diverting excess supply to illegal dealers in neighbouring states. But special agents working for the national forest service are already monitoring a second industrial-size grow site in the Colorado mountains that they believe is back up and running after the winter snow without any regard for the strict electronic tagging system required for each plant in regulated facilities. The contrast between these two worlds – one legal and flourishing, the other illegal and stubbornly disregarding of state lines – can seem baffling, yet it may have profound consequences for whether this unique experiment spreads. Down in Colorado’s Front Range, the cluster of towns and cities that cling to the eastern edge of the Rockies, the scent of what has been dubbed a commercial “green rush” is hanging in the air – literally. On the road in from Denver airport, several of the state’s estimated 800-900 legal growers have taken advantage of cheap warehouse space to open sophisticated indoor facilities, whose odour is clearly discernible by passing motorists. Even before taking into account the construction boom, the local pot industry is thought to have created an estimated 15,000 new jobs over the last four years, with annual sales growing from $400m in 2013 to an estimated $600m this year. The scale of the industry, with its heavy regulation and large cash turnover, has created lucrative work for ancilliary advisers such as accountants and lawyers. Brian Vicente was co-director of the campaign to legalise recreational marijuana in Colorado, and now reaping the benefits of his advocacy. His law firm is one of the fastest-growing in the state, and with 20 attorneys to service several hundred clients in the industry. But making sure the industry stays on the right side of the rapidly changing law is vital to its plans for growth in five other states that campaigners hope may join Colorado and Washington in legalising recreational marijuana by the end of 2016. These include Alaska and Oregon, which are top priorities for campaigners, followed potentially by Massachusetts, Nevada, Arizona and California – a target list which recently prompted Vicente Sederberg to open an office in Boston. This is going to be a very large national market in five to eight years and banks will absolutely want to work with this industry; it’s going to be large and powerful,” adds the law firm’s founder. Vicente has also met elected officials from the UK, Australia, Jamaica and Uruguay, which flew Colorado experts down to South America to advise on how to bring an end to its war on soft drugs. Visiting one of Denver’s scores of new pot shops is indeed a bewildering experience, even for the sober. Livegreen Cannabis, in the suburb of Edgewater, is typical of many that converted from medical marijuana dispensaries – requiring a doctor’s certificate – to a full retail outlet when the law changed in January. The wide eyes and raspy voices on both sides of the counter suggest locals have less difficulty working out where to start, but visitors looking to consume rather than gawp also have to grapple with a ban on smoking in public places, cars and hotels which has so far mostly prevented the opening of Amsterdam-style coffee shops. But a short drive away from the city, in the mountains that also host some of America’s swankiest ski resorts, there is still a reminder of the industry’s grubbier days growing weed in the woods. 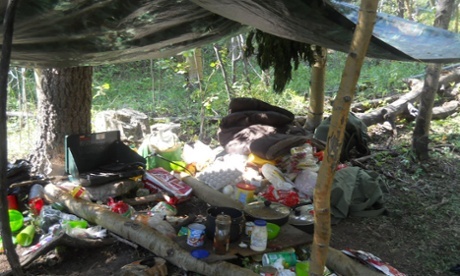 With just 35 uniformed patrol officers and six plain clothes special agents to cover 22m acres over five states, the National Forest Service is struggling to cope with an outbreak that leaves a trail of environmental as well as law enforcement headaches. The White River national park, where a father and son last stumbled across 3,375 plants while hiking late last September, is not as peaceful as it looks. Only this month, roads in the area were closed off after a state trooper was shot while pulling over a suspect vehicle. Ski towns in the area, including world famous resorts like Vail and Aspen, have tried to minimise marijuana suppliers to control any influx of stoned tourists. But even gnarled park service veterans are impressed at the logistical feats required to maintain plantations as large as 8,700 plants miles from the nearest road. Pits are dug to create water reservoirs which are then connected to irrigation systems that would put a golf course to shame. Terraced bunk beds are built in the trees to provide round-the-clock accommodation for crews of farmers and heavily-armed guards, many of whom have come from as far as the drug cartels of Michoacán, Mexico. Just finding the clearing can be hard enough. Trees felled to make way for the bushes have their stumps painted green to prevent them being spotted from the air. Most are found by accident by hikers or if the wind is in the right direction. Less admired are the powerful, but often banned, pesticides and fertilisers left behind by growers which contribute to hundreds of thousands of dollars in clean-up costs for each site. 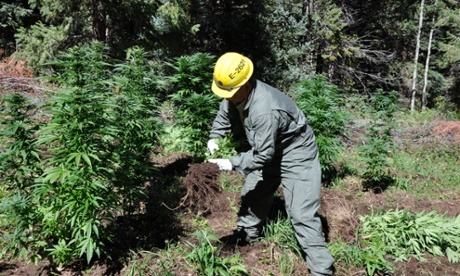 The park service says that, since the legalisation of regulated marijuana growers in Colorado, it has experienced a drop in support from local law-enforcement agencies, according to the park service. “In a lot of cases they have made a determination that this is a federal issue not a state issue any more and they have stepped back,” says assistant special agent Heiko Bornhoff. “ [They tell us] ‘you guys do what you need to do but we are not going to support you in the way we used to’,” he adds. Despite an overall reduction in crime since Colorado’s legalisation of marijuana, many law enforcement agents like Bornhoff remain scepticalof the state’s ability to enforce regulation prohibiting illegally grown drugs entering the legal distribution chain. But for the industry’s advocates, such attitudes are redolent of the failure of some in the law enforcement community to let go of a pursuit which used to keep many gainfully employed.